In upgrading its products and services, ZERDESIGN is expanding into the field of interactive, state of the art learning and marketing technologies. In 2015, a new series of services, SMART, was introduced to the market. The purpose of this group of benefits is to bring together the computer with the human being, the digital world with the real one. The applications mainly have two directions: learning and marketing. SMART covers a comprehensive set of services that include the purchase and sale of equipment, the partial or complete customization of programs, as well as service for machinery. 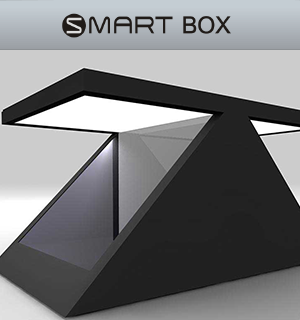 Το SMART BOX / HOLOBOX is a full 3D projection platform which is able to project your product like never before. Combining the most developed and modern projection techniques with an especially elegant design, it yields an extremely impressive result. Modern age in a highly competitive market, companies need new ways to differentiate themselves from their competition. SMART BOX is able to project a hologram of your company’s product or logo, causing consumers to stop and wonder and giving them the opportunity even to interact with the hologram. The product is suitable for shops, exhibitions, airports, shows and other events or points where consumer attention is legitimate. 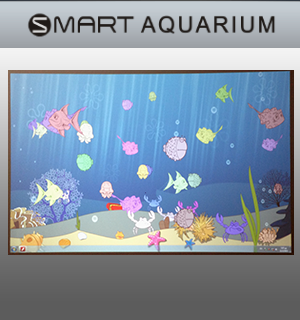 Το SMART AQUARIUM enables children to see their imagination come true within a few seconds. The user draws and transfers his inspiration onto a piece of paper. SMART AQUARIUM scans the image and gives life and three-dimensional movement to the sketch by the use of a projector. The picture interacts in a three-dimensional virtual environment with the creations of other users. SMART AQUARIUM combines the creativity and inventiveness of youth with the use of modern technology by children and their familiarization with it. ZERDESIGN’s SMART BAR is a technologically innovative product which transforms a simple bar into an interactive platform. Send your digital message to any corner of the bar. Enjoy a drink while reading information about it or browse the Internet and stay connected on Facebook. Discover the experience of interactive effects every time you touch SMART BAR. 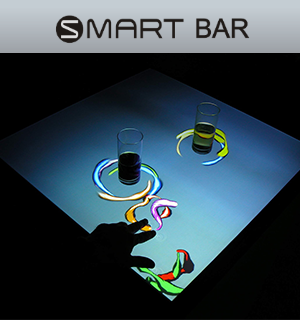 Through sophisticated software and multitouch sensors, SMART BAR has the ability to interact with the movements and intention of users, leading them into a unique interactive journey. 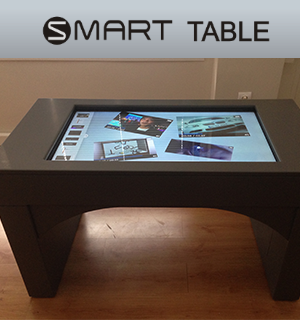 ZERDESIGN’s SMART TABLE is the most ideal way to capture people’s interest and entertain your customers through an interactive high-tech and tasteful experience. Through the large selection of existing software applications, the customer may come in contact with modern touch technology by choosing from a variety of interactive games, presentations and special effects applications. The tables can be tailored to your needs. The customer is entertained by the interactive table, and at the same time he/she gets to know your product or your services. Delivery with standard or modified software, depending on your needs. ZERDESIGN’s SMART FLOOR / WALL converts each floor or wall into an interactive surface that interacts with the natural movement of the person who comes in contact with it. By using SMART software and SMART motion sensors, the user can have interaction with 8 different settings, patterns modified to suit your needs. 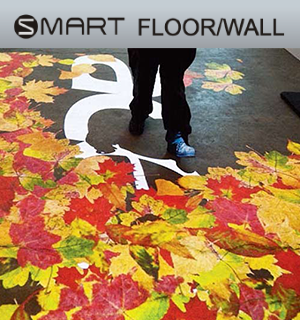 SMART FLOOR / WALL can be used in exhibition halls, multipurpose halls, shops, shopping centers, places of entertainment etc. The potential customer is entertained while getting to know your products and services through interaction. Furthermore, it is very suitable for children, as they can have fun and play. SMART SHOWCASE is a product of ZERDESIGN that can take your breath away with its capabilities for display and its digital touch technology. 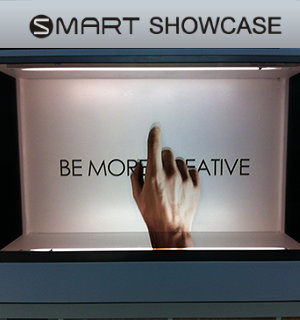 SMART SHOWCASE can be placed in any part of a shop in product presentations, lining it with unique graphics. The products are placed behind a transparent LCD screen and presented, while the screen can display logos, images or videos pertaining to them. At the same time, the customer can be informed about your products by using the touch option of the transparent surface. Zerdesign’s SMART WINDOW enables your business to communicate with your potential customers constantly, as it can transform your shop-window into an interactive 24-hour means of access to your shop. SMART WINDOW can be used for providing information, for selling your products or for attracting attention to the promotion of new products. In this way, a customer can search and learn about he wants. 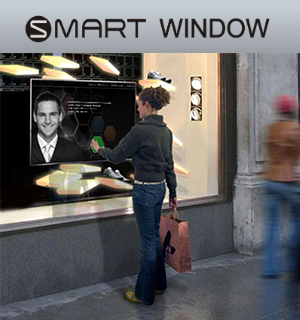 With our smart technology, you will draw all glances of passers-by, as well as entertain your potential customers. 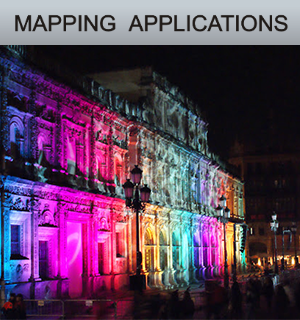 Zerdesign’s SMART MAPPING is the technology of using any surface as a projection screen. The projection is a three-dimensional depiction, adjusted to the shape of the object. The idea is to give life to seemingly static surfaces and to get them to tell their story themselves, as we see them come to life before our eyes. You can project onto any object, from a bottle or a car to a large building. The possibilities are limited only by the limits of your imagination. What is certain is that passers-by and your audience will keep the experience along with your product in their memory for a long time. By using a specialized software and photographs, we map the desired surface and then adapt our projection to its architecture. The result is to have an excellent covering for each side of the object. 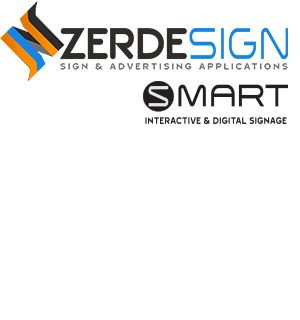 ZERDESIGN’s SMART LOGO is the ideal product for highlighting the logo of your company. This technique uses the direct projection of a video onto your logo. Through special techniques and software, the projection focuses inside its shape and letters. This gives the impression that your logo is coming to life, and because of all the images that move within it, the result impresses and excites the curiosity and attention of passer-by potential customers. SMART LOGO can be used in shops, exhibitions, offices and other locations, giving life to a static logo and making it stand out. 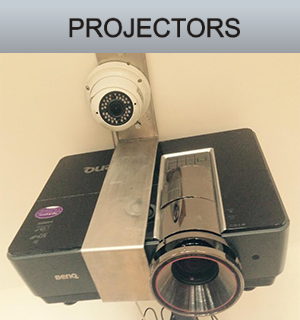 Through SMART, ZERDSIGN gives you the possibility to rent high definition and brightness projectors for multiple uses. For more information on how Zerdesign’s advertising services can serve you, contact us so we can give you a full update.